For most RVers, part of the allure of the open road is the option to take the path less traveled. Seeing the countryside is a significant part of the RV experience, which is why so many people love to use their rigs to explore. However, while charting new territory can sound exciting, it’s less appealing when you get lost. Fortunately, with technology being so advanced these days, you don’t have to have an orienteering merit badge to get around. Instead, you can rely on the best RV GPS units to guide you to your next destination. The whole world is monitored by these satellites, which means that you should never have to stop and ask for directions (as if you would do that anyway). So, with that in mind, let’s take a look at the best RV GPS models and see how they can keep you on track, even if it’s off the beaten path. When comparing the best RV GPS devices, there are a few brands that are well-known for making high-quality machines. Garmin is one of the top names in the industry, and this gadget is perfectly suited for life on the road. Whether you’re a weekend warrior or a full-timer, this GPS is for you. Before heading to the store to buy a new GPS, you may think that any version would do. After all, you probably have one on your smartphone already, so why should you buy another one for your RV? Well, the reason that I highly recommend these machines is that they offer RV-specific features and benefits. In this case, you get a directory of all RV-friendly parks and other services (i.e., waste stations). Sure, you could try to look them up on your phone, but why waste time doing that when you can simply find them instantly on your GPS? Overall, this device is ideal for any RVer, since you can customize your directions based on your particular needs. For the record, I strongly urge you never to use your GPS while driving. However, if you’re with a passenger, then having this bamboo stylus makes it easier to make adjustments while you’re on the road. Even if you only use the stylus when stopped, it’s much better than trying to navigate the menu with your fingers. Entering addresses and points of interest has never been more comfortable. As we’ll see with most of the GPS devices on this list, they are geared towards driving a motorhome. I appreciate that these gadgets take into account things like vehicle height, waste stations, and other elements you need for your RV. I also like that this GPS comes with accessories, such as the bamboo stylus and hardshell case. If you have to detach the machine and bring it anywhere, the case and screen protectors will ensure that it survives without a scratch. As with any GPS, connecting to a satellite can be more of an art than a science. In some instances, the unit may try unsuccessfully to locate your RV for more than a few minutes, so keep that in mind. Also, in rare cases, the accessories listed may not be delivered as promised. If that does happen, return the unit and ask for a new one. Another high-profile name in the GPS industry is TomTom. This company made a name for itself when these devices were becoming mainstream. 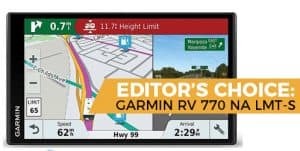 In recent years, TomTom hasn’t made as many strides as other companies (like Garmin), but it’s still a decent option for those who want a dedicated GPS in their RV. Have you ever missed an exit because you weren’t sure which lane you were supposed to be in? Sometimes, GPS directions can be a little ambiguous, meaning that you may have to redirect yourself because you missed a crucial turn. Fortunately, this GPS comes with lane guidance so that you can understand which lane you’re in and which you need to be in for your next maneuver. It’s a small detail, but it makes driving that much smoother. For some RVers, this feature may not be a good thing. IQ routing ensures that you always get the best directions, but that’s based on speed and efficiency. In some cases, you want to take the scenic route, which this GPS may have trouble doing. That being said, most GPS units have a hard time understanding that you’re not always worried about making great time, so this issue is not specific to TomTom. If you’re looking for a useful and straightforward GPS for your RV, this is a decent choice. While it doesn’t come with as many RV-specific features as the Garmin units above, it’s perfect for getting you from point A to point B.
I like the split-screen visuals, as well as the lane assist. Overall, this is a good GPS, if not the best. TomTom has fallen behind companies like Garmin, partly because it doesn’t have the same coverage. The GPS may have trouble finding you on the satellite, and updates may not always be accurate. As I mentioned, Garmin is one of the best names in GPS, which is why three of our options on this list are from the brand. No matter which one you choose, all of them are going to help you make the most of your next RV trip. Let’s see how this one compares. Overall, you can be sure that you will avoid any potential setbacks that could derail your next journey. Having this kind of oversight helps you drive with confidence. One element that you really want in a GPS is the knowledge that all of the maps you use will be current and up-to-date. Fortunately, Garmin has you covered with a lifetime warranty on all routes, including traffic conditions. Just make sure that you’re connected, and they will install automatically. As with the 770 model, this GPS comes with everything you need for an RV expedition. Not only do you receive alerts about potential hazards, but it comes with a complete directory of RV-friendly stops. I also appreciate the visual aspect of the device, with a large seven-inch screen and a dual-interface option. You can see your trip in both a bird’s eye and navigator view to ensure that you don’t miss your next turn. When this GPS updates, it may take a while. Also, in rare cases, some of the updates may erase smaller towns from the map, so keep that in mind if you ever encounter that problem. Although we’ve seen the best RV GPS units from Garmin, you may not want to spend as much money on one of these devices. If you still want the same quality but for a lower price, this basic model from the brand may be the answer. Let’s see what it can do. Because you’re in a large vehicle, you have to worry about steep grades whenever they happen. Fortunately, you can see the elevation on the screen at all times, so you will be alerted if and when a steep grade is coming up so that you can plan accordingly. As with other Garmin RV GPS units, this one has a full directory of RV-friendly locations. One feature I really like is the fact that you can filter these locations based on amenities, such as a pool, electrical hookups, and onsite bathrooms. Although this model is not as high-tech as the other Garmin GPS’ on this list, I like that it’s simple and easy to use. I also appreciate the elevation profile so that you don’t have to worry as much about driving up and down steep hills. Compared to other GPS units, this one can take a long time to update. Also, when these updates occur, they may create glitches, causing you to get incorrect or outdated directions. This problem is rare though. When compared to brands like Garmin or TomTom, Magellan is not quite as noteworthy. Also, this particular model is not geared toward RVs in particular, so you’ll want to keep that in mind. However, it does have a few excellent features that may make it worthwhile. Sure, you’re not going to be screaming down the highway in your RV, but that doesn’t mean you won’t go above the speed limit from time to time. Since you’re in such a high-profile vehicle, police are much more willing to pull you over for traffic infractions. Fortunately, Magellan has your back by warning you of potential speed traps or cameras coming up ahead so that you can reduce speed and avoid getting pulled over. For some people, getting directions like North and South are too confusing. Thus, Magellan has landmark guidance instead, which will guide you based on local landmarks instead of street names or directions. Although Magellan is not as reliable as other brands, I appreciate the intuitiveness of some of these features. The landmark guidance is a noteworthy addition that can make it easier to find your way. I also like the traffic alerts, particularly if you plan to use this device for your car as well. Getting a connection is more of a pain because this company doesn’t have access to as many satellites. Also, since this isn’t an RV-specific GPS, you can’t plan your trip accordingly. Just in case you’re not familiar with this acronym, GPS stands for Global Positioning System. The technology was developed as a way for the Navy to track its submarines with better accuracy, but now it’s so widely available that most people have one in a smartphone. Simply put, a GPS tracks your location via satellite and relays that information to the receiver (the device itself). With a GPS, you will always know where you are, including map information like street names and addresses. As you can imagine, finding a new location is much easier when you have a GPS installed in your RV. Because these devices require a clear connection to satellites orbiting the Earth, the primary issue is that they can lose the signal. If you’re boondocking out in the middle of nowhere, it can be hard to pinpoint your precise location. Another problem that you can experience is if your GPS isn’t fully updated. Although many newer models can download new maps based on your current location, not all of them have this feature. Thus, if you’re using an outdated GPS, the directions may not be very accurate. First, you can program the GPS to navigate based on the size and height of your rig. Taller RVs can’t go in certain areas (i.e., under short bridges), so you have to know those things before it’s too late. Second, you may be able to get a trip planner. Although this feature isn’t standard on all RV GPS models, it’s becoming more and more prevalent. A trip planner allows you to customize your directions based on various criteria you put into the system. For example, if there are points of interest you want to visit, or other necessities (like a waste station), you can program those settings into the planner. Back in the early days of consumer-grade GPS devices, you had to download new maps from your computer onto the GPS itself. Fortunately, now that wireless internet is so ubiquitous, almost all new models will receive new maps and updates automatically. Overall, I highly recommend buying an RV GPS with free lifetime updates so that you don’t have to worry about them. Thankfully, many of them do, so you don’t have to search too hard. If you want the best RV GPS, then I highly recommend the Garmin 770 NA LMT model. Although all of the Garmin units on this list are excellent, the 770 is perfect for your next trip. I appreciate the RV-specific navigation, as well as the accessories that come with the device. No matter what kind of RVing you do, this GPS will help you get there better than the competition.